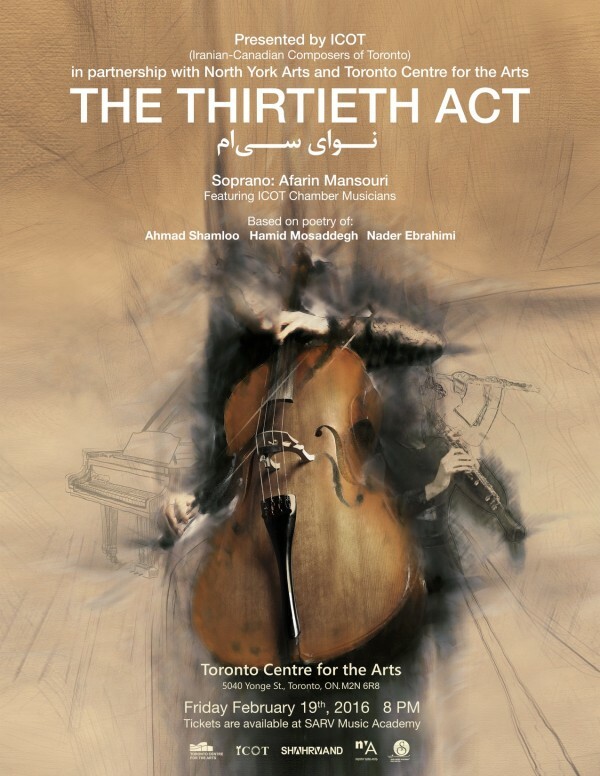 On behalf of Iranian-Canadian Composers of Toronto (ICOT), we invite you to The 30th Act, ICOT’s first concert in 2016! This concert features ICOT’s chamber musicians and four new Persian vocal works based on poetry of Ahmad Shamloo, Hamid Mosaddegh, and Nader Ebrahimi featuring Afarin Mansouri as a soprano. Tickets available at Sarv Music Academy (2 Greenview Avenue, Toronto, ON M2M1R1) or Toronto Centre for The Arts (5040 Yonge St, Toronto, ON M2N6R8) box office.